Syria: Is Aleppo the “Smoking Gun” that will Precipitate a US Proxy War against Russia and Iran? US-NATO is not prepared to let go in Syria. 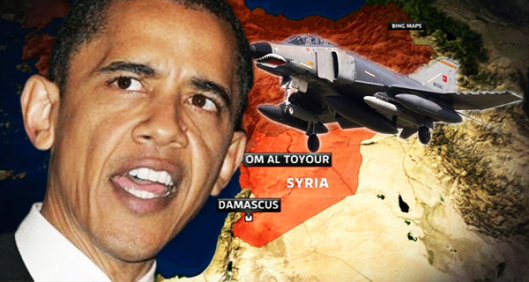 While the US sponsored Al Qaeda and ISIS rebels have largely been defeated, with the support of Russia, Iran and Hezbollah, the Obama administration is now intent upon replenishing so to speak its “moderate opposition” brigades inside Syria with a new influx of jihadist fighters. Following the decimation of Daesh-al Nusrah positions throughout the country, thousands of Islamic militants have fled amidst the outflow of refugees. The Western military alliance has responded to this defeat of “moderate” rebel positions byreplenishing its proxy army, –ie. recruiting and training a new horde of mercenaries and jihadists with the support of Turkey, Israel and Saudi Arabia. The ongoing border crossing of terrorists into Syria is facilitated by the Turkish authorities. This inflow of thousands of Al Qaeda Mujahideen was carefully planned. 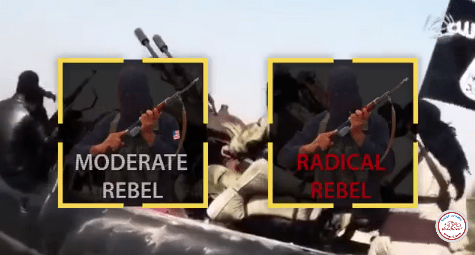 It was preceded by the deployment of US special forces in Syria to oversea and supervise the newly recruited ”moderate opposition rebels” aka Al Qaeda terrorists, most of whom have already undergone paramilitary training. Of significance, these new foreign jihadist “freedom fighters” will de facto [not officially] be under US-NATO Command with US and allied forces deployed on the ground in permanent liaison with NATO and the US military. In recent developments, however, Washington confirmed that another 250 special forces were to be deployed. This took place in April alongside the influx of thousands of new rebel recruits. The influx of jihadists coupled with the deployment of US and allied special forces was carefully coordinated. The US special forces will integrate the ranks of the newly deployed Al Qaeda brigades in Northern Syria which will replace those which were defeated by SAA forces and their allies. Of strategic significance, the influx of special forces and new jihadist troops is changing the composition and identity of ”Syrian opposition” combat forces, most of which are now made up of foreign fighters, including a significantly larger contingent of US-NATO military personnel. When does a “civil war” become an “invasion”? The fiction of a civil war and “opposition forces” can no longer be sustained when a large number of those forces are US and allied troops operating within Syria. So far, officially it’s a “counter-terrorism operation” but there are no terrorists to fight because they have been defeated by SAA forces. Hence the new influx of terrorists. A Proxy War against Russia? The strategy now appears to be evolving towards US-NATO boots on the ground: a war theater with the deployment of special forces and eventually regular ground troops in larger numbers, with the danger that Western forces could enter into direct confrontation with Russian as well as Iranian forces and military advisers. The claims state that Russia’s apparent mission to destroy ISIS is really a facade, and that their real mission is to kill American assets. (Fox New 14, 2015). The “Our Guys” category (“fighting for their lives”) not only includes bona fide “moderate terrorists” trained by the Western military alliance, it also includes an increasingly large number of Western military advisers, intelligence agents and mercenaries deployed inside Syria. The increased influx of foreign forces into Syria leads towards a scenario of escalation and confrontation with Russia. 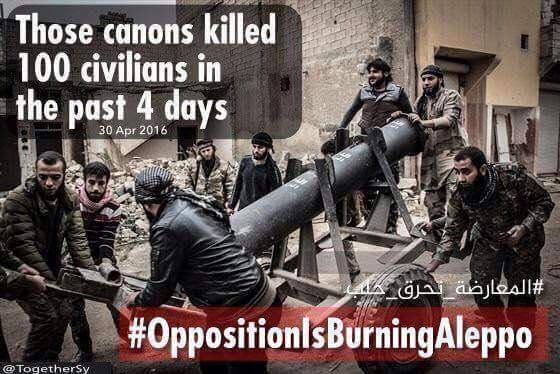 May 5, 2016 in Aleppo, Propaganda, Syria.